It’s clear, though, that Lockerbie is far more than a mere backdrop to their drama. Lost on most Americans, in the shock of a terrorist assault that predated 9/11 by thirteen years, is the impact of a fifty-ton aircraft, still carrying most of its jet fuel, slamming at over five hundred miles an hour into the heart of an isolated community where ‘nothing ever happens.’ Not until they encounter four local women will the Livingstons have any idea of what happened in and to Lockerbie on the day their son died. Greer (Marylynn Aldredge Ehrengard), Fiona (Daisy Blake Perry), and Olive Allison (Stacey Rae Allen) are three representative Scottish women who trade accounts with the Livingstons: the dawning horror of the news reports vs. the instantaneous horror of being there. These three women have been compared to the witches in Macbeth, which probably proves more than anything the poverty of our imaginations when confronting our ignorance of Scotland. Aside from “Amazing Grace” on bagpipes and the Victorian invention of tartan-patterned kilts, what do we even think we know? Have we heard that the Scots are preparing to vote in September on independence from Great Britain—which would dissolve a union dating from Shakespeare’s day? A fourth local woman, Hattie (Vicki Pugmire), bridges the void between the citizens of Lockerbie and Mr. Jones (Lane Richins), who represents the US State Department, which stepped in quickly and firmly after the bombing to assure that events unfolded in the least damaging way for politicians. Without underestimating the importance of what happened prior to his arrival and remains beyond his control, we can say Mr. Jones has set in place much of the ongoing tension that continues seven years later, and holds progress in his bureaucratic grip much as grief does the lives of others touched by the bombing. Actors understandably enjoy playing multiple parts, but audiences struggle to keep them straight and that effort dilutes the power of illusion. Thus playwright Deborah Brevoort’s decision to have each of these seven representative individuals play as a single character adds immeasurably to the gathering power of the drama. Each also plays a vital role in the conflicts that bring the story together, until it hums like a taut cord, and in bringing the play to a series of powerfully felt resolutions. From the atmospheric beginning, the nearby mountains disappearing into mist and growing night, through to a dawn that often seems beyond reach, we are in the grip of master storytellers—as befits a Gaelic tale. The set, by John Wayne Cook, slowly comes alive in response to Jesse Portrillo’s subtle lighting, while Mikal Troy Klee’s soundscape, including evocative music and ambient nature, underscores the repeated gathering and release of tension. Under Fran Pruyn’s flawless direction, all these forces come together. At times the women chant poetry, sing, and move rhythmically, but always in service to the clear unfolding of their story. Like a journey partway round the world, at no point do we feel entirely safe. Nowhere does the outcome appear certain, so that in under an hour and a half what is important changes until it can never be the same again. I must confess here to theatrical greed: I like a play that educates me, as this one does, that pulls apart ideas and makes me think. But I want more: in particular, I want to be wrung out by catharsis, purged of my feelings through their indulgence, a thing that only drama, among the arts, can do well. And here The Women of Lockerbie delivers the real goods. No one who encounters them will ever forget. 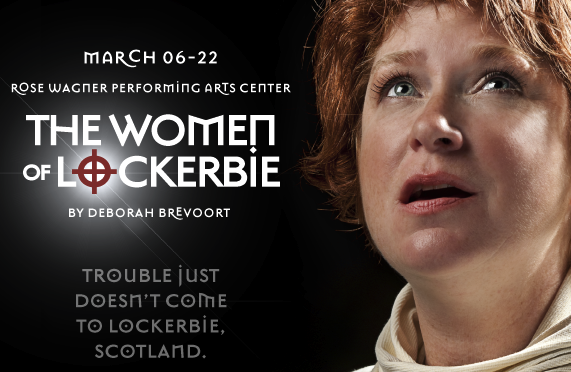 Pygmalion’s The Women of Lockerbie continues at the Leona Wagner Block Box Theater at the Rose Wagner Theater, 138 W. Broadway through March 22: Thursdays at 7:30 pm, Fridays and Saturdays at 8:00 pm, Sundays at 2:00 pm, with an extra matinee on March 22 at 2:00 pm.